Peter Glanville was one of a number of local players who came into the Gloucester side in the seasons of struggle which followed the break-up of the side which had taken the club to the brink of the Courage League title and the Pilkington Cup in 1990. Unlike some of the others, Glanville carved a regular niche for himself in the team and the fans’ affections as a brave and intensely committed back-row forward. Born in Gloucester on 10th June 1971, Glanville grew up in the city as part of a rugby family (his father Brian ran the line and organized the officials at Kingsholm for many years) and played for Longlevens before moving to Kingsholm. Although occasionally employed on the other side of the scrum, Glanville’s specialist position was blindside flanker, and he wore the Cherry and White number 6 shirt with distinction between his debut in the autumn of 1992 and his last Premiership appearance as a substitute against Bristol at the Memorial Ground in December 1999. In total, he played 143 times for Gloucester and scored 20 tries. Glanville’s rich blend of aggression, bravery and tireless commitment was a key component in the Gloucester side which regularly flirted with relegation in the mid-nineties. This was especially noticeable in and around the breakdown, where he was both a powerful tackler and very good at competing for the ball once the tackle had been made. He was also a fine handler of the ball, and, while not the quickest player ever seen in a Cherry and White shirt, he was, as a result of his astute reading of the game, capable of making his presence felt all over the field. 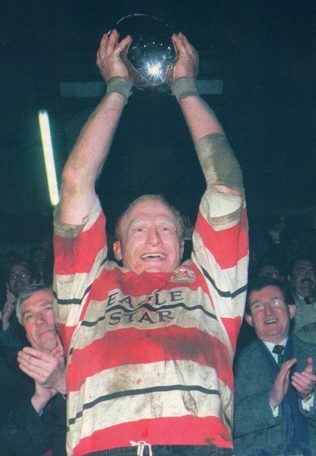 These virtues made him very popular with both fans and team-mates alike, and he was rewarded with the captaincy of the club in the 1997-98 season, at the end of which he lifted the Cheltenham and Gloucester Cup, a trophy which, although now largely forgotten, was important in laying the foundations of a more successful future for the club after a long period of decline. After his last couple of seasons at Kingsholm had been disrupted by injury, Glanville served as Team Manager at Kingsholm under the direction of Philippe Saint-Andre before joining Cinderford. As coach he guided the club to National League One, just two levels below the Aviva Premiership, a remarkable achievement for a small club from rural Gloucestershire.